Christopher D. Green, professor of psychology at York University in Toronto, Canada. interviews, discussions, reviews – everything related to the history of psychology. As always, the primary intended audience is students in college and university courses on the history of psychology. We always welcome teachers using these podcasrts as “assigned listening” in their courses. Brief reviews of important, recently-published journal articles on the history of psychology. by Alan J. Fridlund, Hall P. Beck, William D. Goldie, & Gary Irons. Where did they come from? Where di they go? full-fledged “industry” in the early 20th century. The focus of each episode is an interview with an expert on a featured event that occurred during that particular week in psychology's past. In addition, each episode begins with brief descriptions of several events from that week and ends with a celebration of the week's birthdays (and other anniversaries). Each episode is about 25 minutes in length and is freely available to anyone who is interested in the topic. Aug 28-Sep 3. Raymond Fancher on Sigmund Freud's only trip to the United States. Sep 11-17. Malcolm Macmillan on the life and myth of Phineas Gage. Full interview with Malcolm Macmillan (50 min). Sep 18-24. Alexandra Rutherford on B. F. Skinner's 1971 appearance on the cover of Time magazine. Sep 25-Oct 1. Michael Sokal on James McKeen Cattell's 1917 dismissal from Columbia University. Oct 2-8. Wayne Viney on the 1890 publication of William James's Principles of Psychology. Oct 9-15. Thomas Blass on Stanley Milgram's shocking studies of obedience. Oct 16-22. John Shook on the life of the founder of the modern American school system, John Dewey. Oct 23-29. Lawrence Stern on the intelligence of James McConnell's cannibalistic flatworms. Oct 30-Nov 5. Gerald Grob on the impact of the Community Mental Centers Act of 1963. Nov 13-19. Michael Rashotte on the last book by revolutionary behaviorist. Clark Hull. Nov 20-26. David Robinson on the founder of experimental psychology Wilhelm Wundt. Nov 27-Dec 3. William Tucker on the controversial ideas of personality theorist Raymond B. Cattell. Dec 4-10. Ludy T. Benjamin Jr. on Nobel prizes won and lost by psychologists and "near-psychologists." Jan 7-13. Robert H. Wozniak on the developmental and evolutionary psychologist, James Mark Baldwin. Full interview with Robert H. Wozniak (53 min.). Jan 21-27. Harry Heft on James J. Gibson, the founder of ecological psychology. Jan 28-Feb 3. 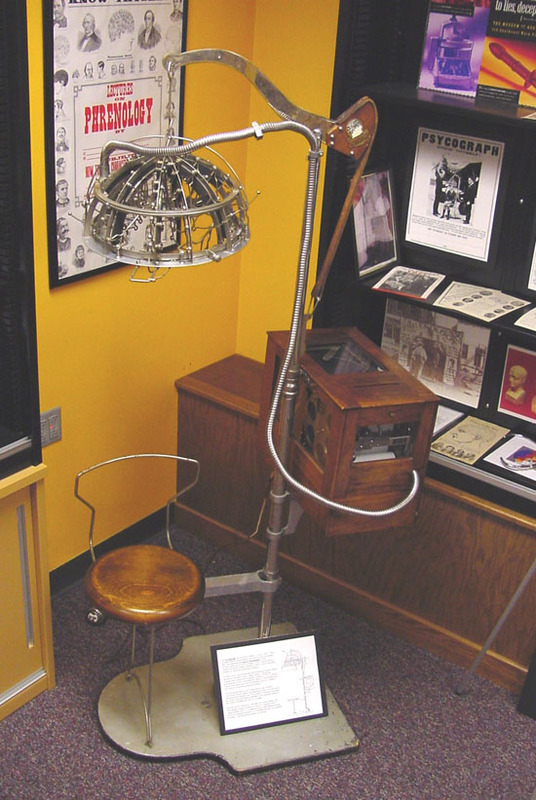 David Baker on the psychograph [picture], the 1930s’ automatic phrenologist. Feb 4-10. Ludy T. Benjamin Jr. on the 1988 splitting of the American Psychological Society from the APA. Feb 11-17. Eric Engstrom on Emil Kraeplelin, the man behind the modern categories of mental illness. Feb 18-24. Charles Brewer on John B. Watson, the founder of behaviorism. Feb 25-Mar 3. William Tucker on the career of the controversial intelligence man, Cyril Burt. Mar 4-10. Dorothy Ross on the founder of the APA, Granville Stanley Hall. Mar 11-17. Henderikus J. Stam on the first studies in which rats were run through mazes [picture]. Mar 18-24. Wade Pickren on pioneering African-American psychologist, Oran Eagleson. April 1-7. Raymond Fancher on English polymath Francis Galton. April 15-21. Michael Wertheimer on the founder of Gestalt psychology, Max Wertheimer.